As I sit down to write my first column in The Messenger, I am totally humbled by the confidence that you, the community of Rodef Sholom Temple, have shown in me by electing me to be your President for the next two years. Even though I’m a relative “newbie” to RST, having only been a member for approximately four years, I have been welcomed into the community with open arms. When I, and the other B’Nai Israel congregants, joined RST, I really didn’t know what to expect. It was an emotional time as we were bringing to an end a synagogue that had been in existence for over 100 years, but Rabbi Dror and all of the wonderful RST members made us feel at home. What an exciting time to be the President of the congregation! Not only do we have an amazing spiritual leader in Rabbi Dror, but we have an energized Board of Directors and an energized congregation who have focused on the relocation of our community to the UJC campus…and I might add that we have been extended a wonderful welcome by the UJC staff! There will be hiccups along the way as we adjust to having three congregations functioning on the UJC campus. As long as we continue to work as a team with all partners, there is no issue too big to solve. However, during relocation, while our new building is being constructed, we still have our normal synagogue-related duties to perform and matters to address. The High Holy Days will be soon upon us and our staff, Rabbi, and Ritual Committee have been hard at work to make sure that your High Holy Days experience will be just as meaningful at the UCJ as it was on Whealton Rd. I’m looking forward to the services at the UJC as I know they will be wonderful. During the summer, Rabbi Dror took a very well deserved and well needed vacation. As I attended Shabbat services on Friday nights and Saturday mornings during her absence, I was continually amazed at the lay leaders who conducted various parts of these services as well as Monday and Thursday minyan services. If I try to list everyone who stepped up to the plate, I’m sure I’d unintentionally leave someone out, but from the bottom of my heart, I extend a huge thanks to everyone who pitched in during the Rabbi’s vacation. 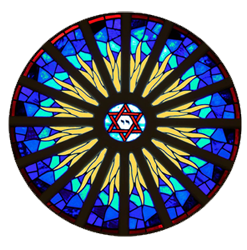 Coming on the heels of Rabbi’s vacation is the vacation for the Masons and once again, our community, led by Sisterhood, jumped in to make sure that duties that fell to the Masons, primarily meals, were taken care of so that we didn’t miss a beat…. I can’t say enough for all of our volunteers! Donald’s vacation is also soon approaching and I’m sure, once again, the RST community will step up and do what is needed. As I close for this issue, I have to give a big thank you to Tess for all that she does for RST in normal times, not to mention the stress of relocation, and for attempting to keep me straight as I navigate the Presidential waters! We have so many outstanding members of our congregation, and I will try to highlight them in each of my future columns.